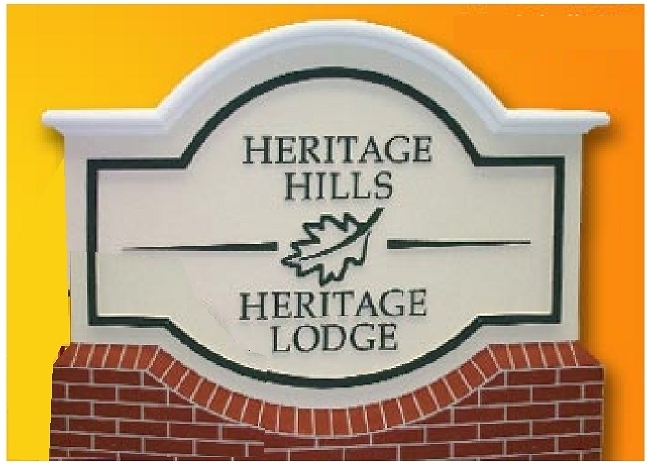 This black & white monument entrance sign for Heritage lodge has with a faux brick base and simple oak leaf logo, which conveys elegance in a natural setting. These EPS signs have a hard shell to protect against vandalism; see Product Line Gallery 6 for more details and over 60 designs of our EPS (Section C) and post-and--panel Monument Signs. To see over 125 other EPS dimensional monument signs, premium 3-D or 2.5-D carved, sandblasted, or engraved, High-Density-Urethane (HDU) or wood post-and-panel entrance signs for hotel, motels, inns, and B&B's, please click on "Return to List" below right. We can make a sandblasted or carved EPS, wood or HDU entrance sign of any design in any size from 3 ft to 14 ft wide. The EPS monument signs are fabricated as a single piece, self-standing, supported by 2 steel posts, and require no other support. The wood or HDU panel signs can be placed on a stucco, stone or brick monument base, between iron or wood posts, or on a wall or gate. We can customize these signs with any shape, border, font style, or color scheme with carved (engraved) or raised text and art of your choice.